Morning 5.30 a.m. to 10.30 a.m.
Evening 5.30 p.m. to 8.30 p.m.
By the grace of Lord Ayyappa, Shri G.D.Sigamani and Smt. 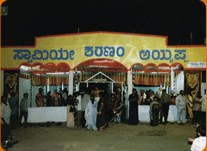 K.A.Shantha Kumari with the co-operation and support of Ayyappa devotees, a small temple was established at 13th "A" Cross Road, 10th Main, Vyalikaval, Bangalore - 560003 on 13.07.1989. The progress of the temple was further strengthened by the Area councilor Shri R.Venugopal Reddy, Ex-Corporator. 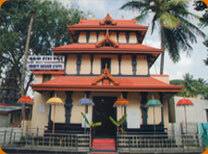 Since its inception seasonal poojas have been performed and number of visitors to the temple keeps on increasing. 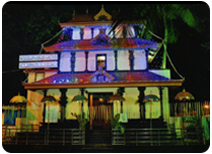 In all important seasonal days, Vilakku poojas, Annadhanam, Light music programmes have been organized in the temple. In the year 1990, Lord Ayyappa idol (Vikragam) was installed. Shri G.D.Sigamani as Managing Trustee with the following as trustees. Shri G. Srinivas Kamath Shri S.R.G.Nathan. 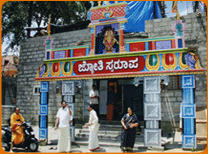 Soon after the trust formed, the trustees with the co-operation and support of nearby residents of Vyalikaval, Kodandaramapura and Malleswaram started renovating the temple to facilitate easy dharshan to devotees. On 13.07.2000, with the support of V.K.M. Ayyappa Swamy Association, a development committee was started with the chairmanship of B.K.Sivram and along with the following office bearers.